I don’t know what it is, but I’ve been on a streak of rotisserie type meals for the past week. Just can’t get enough. At work last Friday, we decided to order in from the Montreal famous Chalet BBQ on Decarie. It’s an old classic and a great one at that. People already know this – the place has been voted as the #1 rotisserie in the city by the Le Choix des Connaisseurs and is one of oldest in town, having been open since 1944. They serve home-style chicken that makes you feel like you can eat forever it’s so good. The chicken here is notably different than Romados – the skin is softer and the BBQ sauce is saltier. The insides are just as juicy, tender and delicious. The chicken is roasted over a charcoal bar-b-q and tastes like down to earth, simple food you eat when you’re craving something familiar. We got two hot chicken sandwiches – one filled with white meat and the other with dark, a half chicken which was unceremoniously wrapped in loose transparent plastic (don’t worry, this didn’t take away from the experience), and some chicken leg meals. Chicken to perfection. 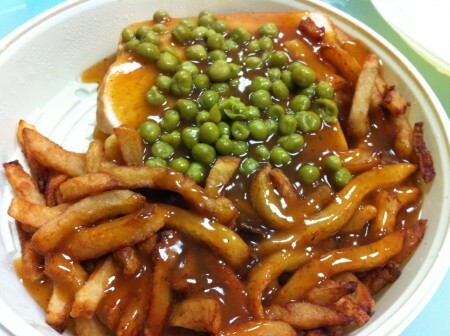 Tags: Chicken, Chicken Leg, Classic, Decarie, Fries, Gravy, Half Chicken, Montreal, Rotisserie, Special Sauce.